Mr. Man is a kinesthetic learner. He learns through movement, and doing, and trying. 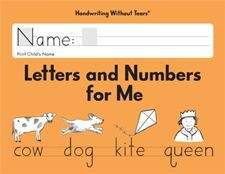 Handwriting Without Tears is an ideal program for kinesthetic learners who need lots of hands on repetition to internalize information. Handwriting Without Tears uses multisensory methods to “teach effectively with joy”. 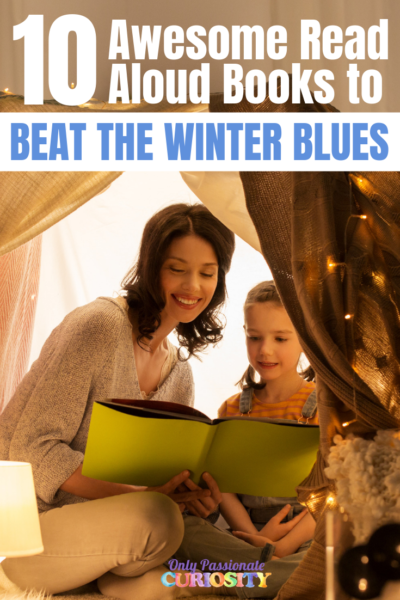 The idea is that if you can work with a child’s natural developmental abilities, and teach them in ways they will connect with, the skill of handwriting can be learned without fuss and fight. When I heard I was going to get to review the Handwriting Without Tears Kindergarten Teachers Guide and Student Book, I immediately bought the wooden letter formation pieces and slate chalkboard (if you can’t afford, or don’t want to purchase their wood pieces, the teachers manual includes a pattern for you to make your own out of cardboard, paper, or foam) so I could really take advantage of the full program and it’s strong kinesthetic methods. The teacher’s manual is a fantastic place to start to really gain an understanding of the Handwriting Without Tears methods and philosophy. It has many useful prewriting activities, such playing games and singing songs to learn the letter strokes and basic concepts such as left, right, horizontal and vertical. 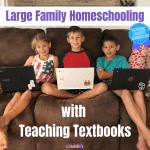 It is written to a classroom setting, but almost all the activities are easy adapted to home use and individual students. Reading the teachers manual didn’t take me very long, but I can honestly say it is one of the most helpful teacher’s manuals I have ever come across. Once I read it, I felt fully prepared to teach the Handwriting Without Tears program to my child. In the Kindergarten Book, capital letter formation is taught through a series of activities, songs and sayings. First, we built the letters with the wood pieces, reinforcing the shapes that the letter is made of, and the order it is formed. 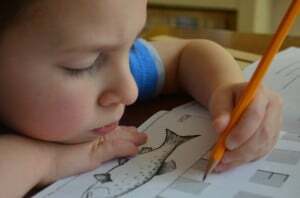 In Handwriting Without Tears, to learn capital letters, the child really only needs to know 4 strokes, Big Lines, Little Lines, Big Curves and Little Curves. After we build the letters, we move to the slate chalk board to do “Wet, Dry, Try”. First, the parent demonstrates the correct way to form the letter, using the Handwriting Without Tears step-by-step instructions. For example, for the letter F, I would say “Start in the Starting Corner (which is clearly marked with a happy face on the slate board). Big Line Down. Frog jump to the J. Little Line Across the Top. Little Line Across the Middle.” At that point, Mr. Man then traces the letter with a small, damp sponge square while we both say the steps. Then he dries the letter with a small piece of crumpled paper towel, again saying the steps. Finally, he uses the chalk by himself, and correctly writes the letters while saying the steps again. If you don’t want to use a chalkboard, there is an app for Handwriting Without Tears– but the different textures and sensory experiences offered during “wet, dry, try” really do help cement the movements in a kinesthetic learner. In our home, we used the chalkboard during lesson time, and the app for independent practice. 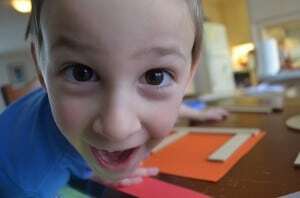 Once the child has mastered the letter on the slate chalkboard, he is ready to move on to the workbook. 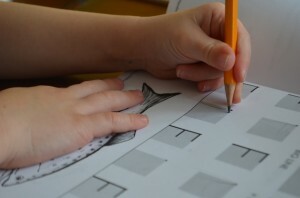 The workbook uses grey squares with a dot in the starting corner for the letters to remind the child of the chalkboard and how they formed their letters with “wet, dry, try”. The top of the workbook page has samples of how the letter was formed both with the wood pieces and the slate board, as well as step-by-step letter formation instructions. Finally, the child is taught to check his own work. Mr. Man knows to look to see if he “bumped” all his letters to the lines, and see if he followed all the letter formation guidelines to write the letter correctly. After he has checked his work, he enjoys coloring in the small pictures on the page as a treat for his hard work. The Kindergarten level teaches capital letter formation first, and has kids writing in all caps for the first half of the year. I disagree with this methodology because proper sentences are made up of mostly lower case letters, and I didn’t want to confuse my child by teaching them to write in all caps, and then trying to get them to change their habits later. However, Handwriting Without Tears says teaching capitals first is important for a few reasons. First, capitals are easier to form, and the program is written developmentally, so easier to learn letters are taught before the harder to learn letters (using the Handwriting Without Tears Winning Order). Capital letters all start at the top, they are all the same height, and they are all easy to differentiate and identity. Lowercase letters are a different story, they have more than one starting location, they are not the same size, and many letters, like p, d, b and q are difficult for a small child to differentiate. They do have a point here. I have not seen a single reversal from my child when he is writing the Handwriting Without Tears capital letters, however, he is now writing his name with a combination of lowercase and uppercase letters, when before we started, it was correctly written with a starting capital and lowercase letters (this was the only word he knew how to write before starting this program). In my home especially, Handwriting Without Tears was a big hit because it taught me how to work with my left-handed child. The teacher’s manual has explicit instruction on how to teach pencil grip and how to angle the paper to avoid left-handers “hooking” their wrist. The workbook is set up with frequent example letters, both on the left and right of the page, so both left and write handed children can see the sample (where a typical handwriting workbook only has one sample, on the left, which a left handed child would block while writing). The workbook lies completely flat on the table which allows for stress free learning for Mr. Man. Sample Letters on both sides= left handed friendly! I also enjoyed being able to access the online printable resources which allowed me to print practice pages. I was able to print extra worksheets with his name, as well as his spelling list and reading words from his other lessons. In the 6 weeks I used this program Mr. Man went from only being able to write his name, to being able to form the capital letters correctly. He has gained confidence, and will now write simple words with ease. He enjoys his lessons, especially doing “wet, dry, try” and often plays on the app for fun. While I can’t honestly tell you every lesson has been without tears (what homeschool doesn’t have its down days? 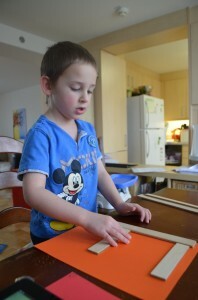 ), I can say that this method has been painless for me to teach, and easy for him to learn with. I am so proud of the progress he has made, and am so impressed with this program that we will continue using it with him for the foreseeable future. This program is not for the faint of heart, if you’re really going to follow the whole system. 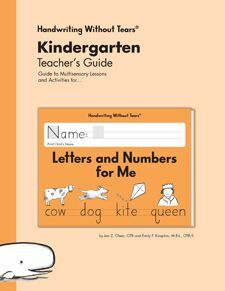 For a workbook kid, you could really get by with just using the teachers guides to help you work through letter formation and have them “go” with the workbook. But, for a child like Mr. Man, you’ll be glad to have all the bells and whistles and wonderful teaching tools that are included in the Teachers Manual. The Wooden Letters, Slate board and other Handwriting Without Tears Accessories are available online as well. For more Reviews on Handwriting Without Tears, level s Kindergarten through Third Grade, as well as Crew Reviews of the Handwriting Without Tears “Wet, Dry, Try” App, visit the other crew blogs linked in the banner below! Disclaimer: I received a free copy of Handwriting Without Tears Teachers Manual and Student Book through the Schoolhouse Review Crew in exchange for my honest review. I was not required to write a positive review nor was I compensated in any other way. All opinions I have expressed are my own or those of my family. All other Handwriting Without Tears materials mentioned in the review were self-acquired. I am disclosing this in accordance with the FTC Regulations. I still think lowercase should be taught first. It kind of annoys me at this point that Mr. Man writes all his words in all caps, and I feel like now I have an extra step (and possible battle with this stone headed little guy) to teach him how words should be written. Maybe the transition will go smoothly, but I am not sure. That being said, we still use this program with him, and really enjoy this program with him. 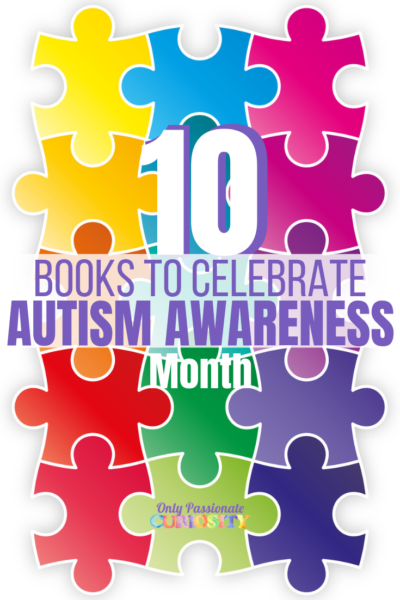 For a kid like mine, who NEED the multi-sensory, and need all these steps and reinforcement, it’s invaluable. Mr. Man is a lefty, and I had no idea how to teach him to write. He didn’t want to learn, and HWT helped me get him writing letters in a matter of weeks. Since yours is still so young, my advice to you would be to ride it out for a little while. You can write letters in sand or a salt tray with your finger. You can build them out of objects, like twigs or anything really. 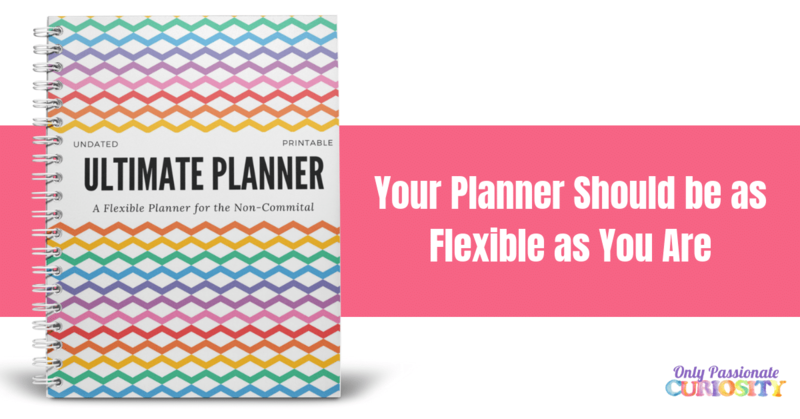 You can use chalkboards or dry erase boards. You can play and watch and see. I consider HWT to be a “big guns” program. The teacher training is awesome, and so are all the different materials available to help teach. But- I wouldn’t use it for a kid that doesn’t need the bells and whistles. My oldest learned his organically (basically doing the things outlined above) and moved right into copywork from MY handwriting. Now, he is learning cursive with the Logic of English handwriting program with success. Mr. Man will only use HWT for this first level to get the ball rolling, then I will also move him to copywork and Logic of English. I hope that helps! Let me know if you have any other questions! I didn’t do this review. I used HWT in the early grades but not very successfully. I didn’t do all the things it said to do, so I think it didn’t work as well for me.